So, I take it a lot of your family use e-mail. I’m sure you’ll agree that it is a nightmare remembering a long string of letters & numbers that we call an e-mail address. Eventually, it just gets you going mad! How about when you want to make a new e-mail, and johnsmith@gmail.com’s taken, and you have to resort to 97john364smith17@gmail.com. 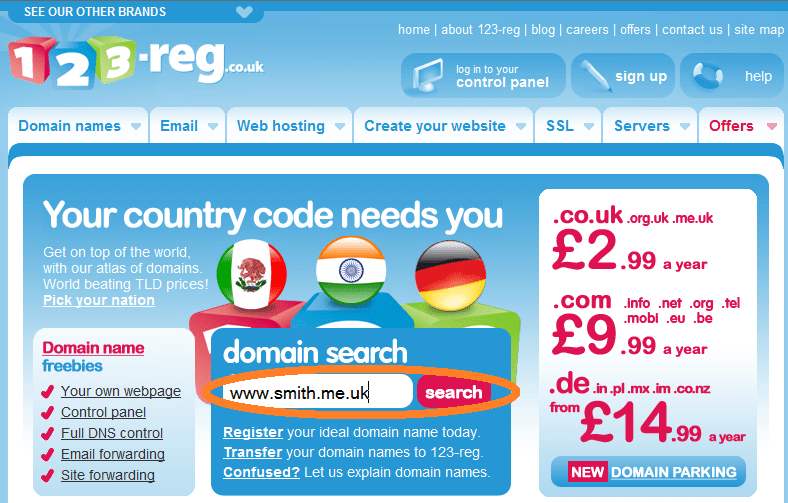 This can all change to a simple address, such as john@thesmiths.net if you buy your own domain, which is very cheap. You can even import all your old mail & contacts, and set up mail forwarding. Follow these steps below to do this. Please note that I’m using 123-reg.co.uk, which is based in the UK. 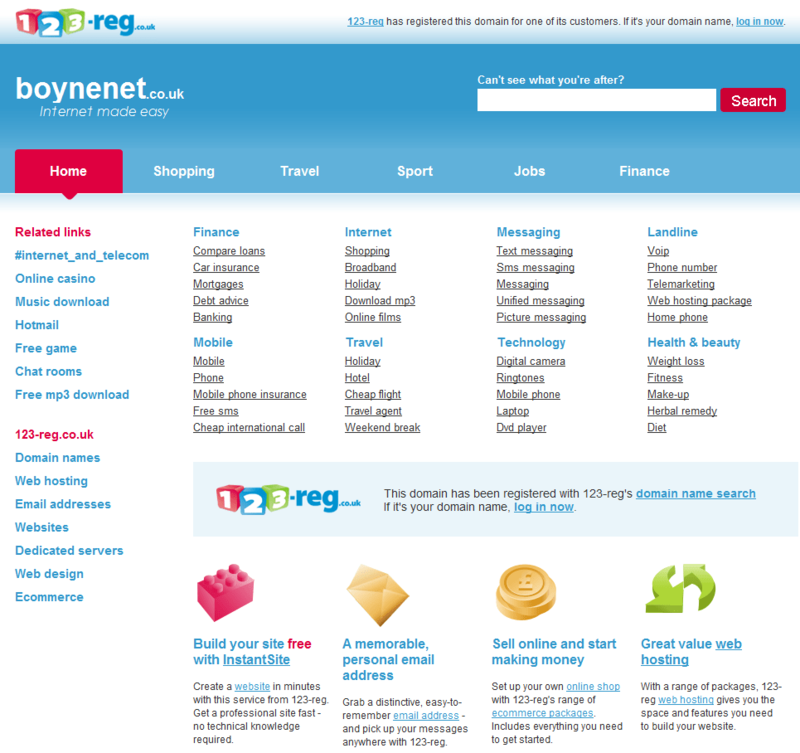 If you’re not from the UK, you may prefer to use a host based in your country. In the US, for example, go to godaddy.com, dreamhost.com. but the main steps that I’ll show you should be very similar. Head over to www.123-reg.co.uk if you’re in the UK (read above if you’re in the US). 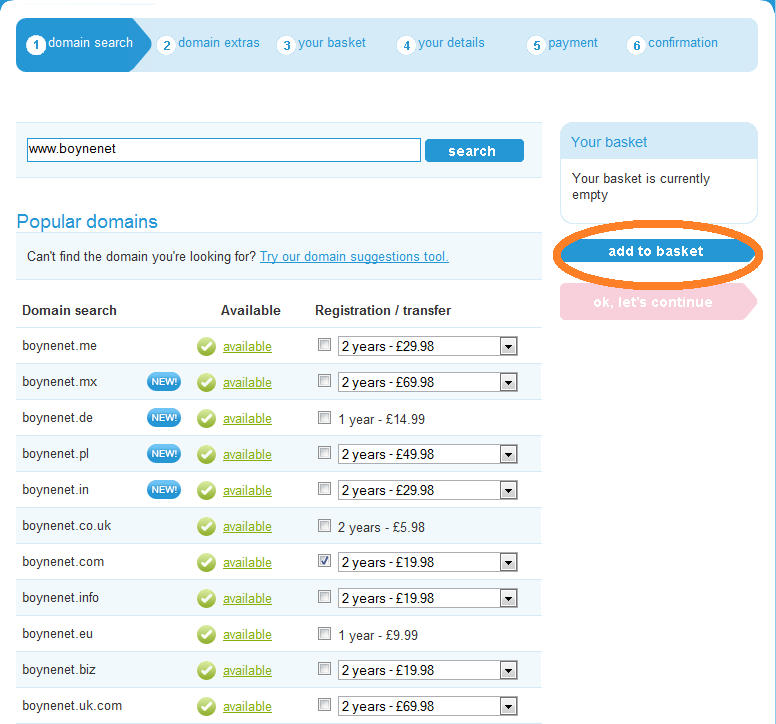 Type your desired domain name in the domain search box and click the search button. On the next screen, it’ll tell you if it is available, and if so, with what endings (i.e. com, net, org, org.uk, me.uk, etc). Keep searching until you find one you like. Then, click the “OK, let’s continue” button. You may then see an offer for extras, which can be ignored. Click the “OK, let’s continue” button again. Follow the prompts to create your account. When you’re done, simply click the login button on 123-reg and log in with your new username and password. After you have done this, your registrar will register the domain and configure it for you. This can take anything from 2 minutes to 2 days. If you enter the domain into the browser and you see your registrar’s parking screen (like below), your domain is working! Head over to http://www.google.com/a, click the Standard button on the right, and then click the Get Started button on the top right. Say that you’re an administrator, type in all your details, and follow all the prompts. Stop when you see the control panel. When asked for an e-mail, I suggest you use an older one, so that you don’t have a problem if you forget your password. Select ‘CNAME’ for the verification record, and click Continue. Then, you need to go back to your registrar’s control panel, go into the DNS Management page, and make a new subdomain called googlexxxxxxxx (the long string of letters and numbers given to you), as a CNAME, pointing to google.com (It may not make sense now, but you’ll see when it’s on the domain!) When you’re done, simply click “I’ve completed the steps above” and you’re almost done! 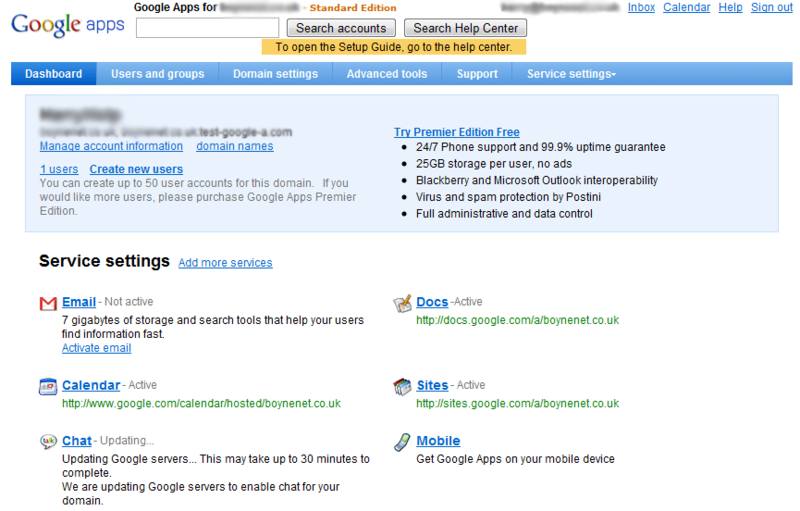 Choose your hosting company and follow the instructions (if it isn’t listed, then just click “Any Hosting Company”). Once you’ve done that, it may take a while, but it’ll be done within 48 hours. Click Settings at the top, and then e-mail. Click “Forward the e-mail to:”, and add your e-mail address. You don’t have to do that, but that means, if someone types jon@smith.co.uk, instead of john@smith.co.uk, or anything else that isn’t an e-mail address, it just goes to you anyway. Click Save Settings. Finally, click “Change URL” at the top of the page, and choose mail. Click Save Changes, follow the prompts, and you’re done. When it’s done, make your user names on the control panel, and load up the inboxes. When done, you can import your mail and contacts (please note you may have to wait 24-48 hours before it becomes available). Just click the Settings button at the top of the Inbox, click Accounts, and follow the prompts. You can also forward all your e-mail sent to your address, or configure it in an e-mail client (i.e. Outlook) by clicking on “Forwarding and POP/IMAP” and following the instructions. You can also use the Advanced Tools in the Control Panel to import e-mails from Outlook. After it has all been propagated (put through), you’ll have a fully functioning e-mail system! You can access it from mail.yourdomain.com, and, to get into the Control Panel, all you have to do is click the “Manage this domain” button at the top. There are loads of options for you to play around with (including up to 50 users and changing the Gmail logo to your own), so play around when you’ve got some time on your hands. Enjoy your new personalised e-mail address!